Much stronger and will last longer when made with a steel ring at the end! These are handy for safely hanging a bucket from anything---a trailer post, tie loop or a fence rail. Just adjust it to the length you want, slip the snap around the post & through the polished steel ring & fasten the snap to a bucket handle. The 1" wide nylon strap is adjustable from 14" to 24". The sturdy snap has a 1/2" opening. Available in black. 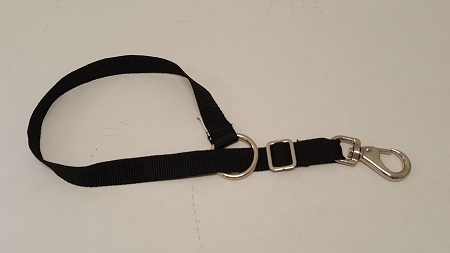 This product is sometimes used as a breast collar strap, by simply attaching another snap. These straps are the handiest things ever. They not only hold up buckets but are great on stall doors or to hold panels shut at campgrounds and shows. I keep several on hand for all kinds of jobs.